Parking is not permitted within the parking areas of Cherry Tree Court. Parking is available at Moul Field. See brochure for directions. In the early 1900s, the trolley lines of the York Railway Company served the needs of many county residents for both business and leisure travel. Weekday routes served daily commuters, while weekends featured special cars to picnic groves, churches and shops. Construction of the York and Hanover trolley line began on May 1, 1907. The “Hanover Fast Line” opened on February 29, 1908 and provided an efficient transportation link from York’s little-known, outlying communities such as Sunnyside, Bairs, Menges Mills, and Jacobs Mill to the growing towns of Spring Grove and Hanover. The popularity of the automobile doomed trolley transport, and service to Hanover ended in 1938. 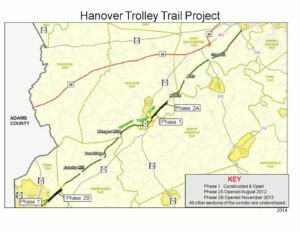 A 2003 study, conducted for the York County Rail Trail Authority, concluded that 85% of the original 16.5-mile trolley corridor remained under the ownership of Metropolitan Edison Company and was suitable for trail development. 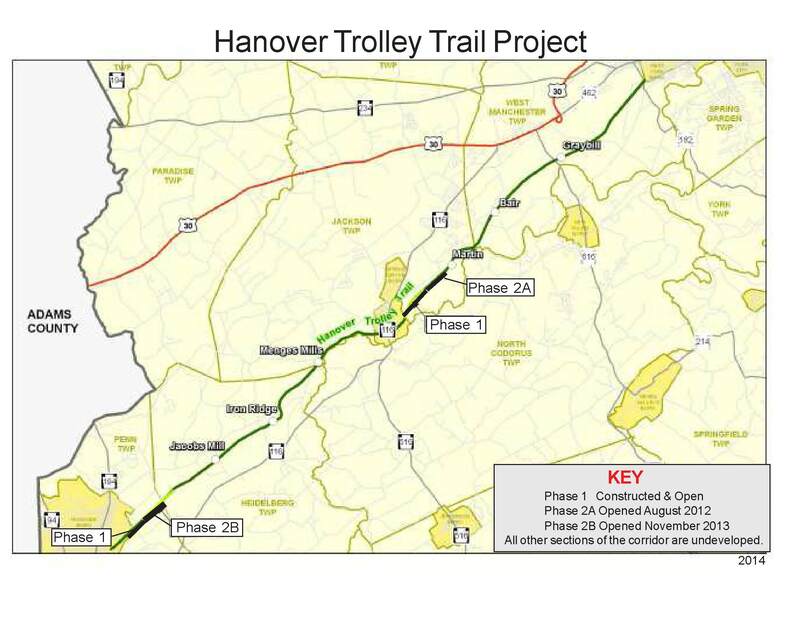 The study also recommended that development begin with two sections: (1) 4.5 miles linking Menges Mills to Bair Station and located in Jackson Township and Spring Grove Borough (2) 1.5 miles from Hanover Borough to the Penn Township/Heidelberg Township Line. These sections opened to the public in fall 2008. Phase 2 in Jackson Township was completed and opened in 2012. Phase 2 in Penn Township was completed in 2013.